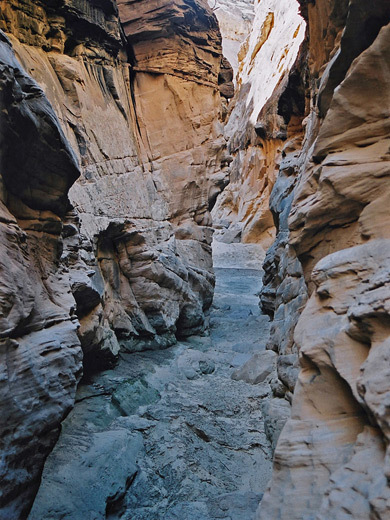 It is not particularly narrow, or very long, or very deep, but Forgotten Canyon (aka Secret Mesa Canyon) offers a perfect wilderness hike in a remote corner of the San Rafael Swell, itself one of the least visited parts of Utah. 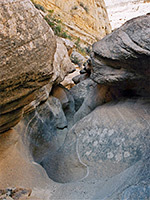 Forgotten is a north side tributary of Eagle Canyon, a few miles from I-70 near the western edge of the Swell, and features a mixture of smooth and jagged passageways through Kayenta sandstone, while upstream it changes to a wider, bushy valley with a few narrow side canyons. The best aspect of this little known region is the absolute solitude and pristine scenery. I-70 approaches the San Rafael Swell from the east starting from a low of 5,620 feet across Muddy Creek, where it begins a long steady climb 1,500 feet up the east slopes of the swell, peaking near the highest point in the whole region - 7,921 foot San Rafael Knob. Eagle Canyon drains an area north and east of this summit, and deepens as it meanders northwest so that as I-70 crosses the gorge, between mileposts 119 and 120, the canyon floor is over 200 feet below. 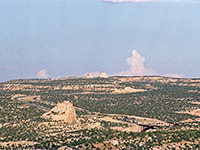 Exit 116 of I-70 includes a rest area with a viewpoint of the canyon and the surrounding rocky landscape. 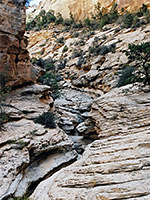 Eagle Canyon has various hiking possibilities, starting points for which are within a mile or two of the interstate along short side roads. Forgotten Canyon is a little further away, reached by first driving along the Moore Cutoff Road, exit 116 (also used to reach Devils Canyon) - a wide, recently (2009) paved route linking I-70 with the small town of Moore, 16 miles to the northwest. The first part of this used to run along a narrow ridge, the highest point for miles around, passing several good camp sites right on a cliff edge, with excellent views over the Eagle Canyon system to the east and the distant Wasatch Plateau to the west. This section has since been bypassed by the main route, making it even better for camping. Three miles from I-70, a small, unmarked track leaves the Moore Road to the right - through a gate and then over uneven, hilly ground, reaching the vicinity of Forgotten Canyon after about 4 miles and eventually crossing the lower end of Eagle Canyon after another 3 miles. The track, which is bumpy, rutted, narrow and very little used, heads initially northwest, across a dry wash then turns back east and climbs steadily. A suitable place to park for this hike is anywhere around where the track turns once more to the northwest, though near here is another wash with a steep, stony ascent just beyond that may be too rough for 2WD vehicles. 10 views of Forgotten Canyon. TopoQuest topographic map of Forgotten Canyon; the narrows are northwest of the 7022 foot summit. There is of course no trail to the canyon. The route is cross-country in a northeasterly direction for about half a mile, across bushy, generally flat land, heading just west of a small summit of elevation 6,802 feet, then along a promontory at the edge of Eagle Canyon. On the left is a steep side ravine while on the right the rocks slope more gently, allowing quite an easy descent down small ridges and slickrock inclines to the streamway. There are many choices as to the exact route. Turning right (upstream), the canyon narrows a little and Forgotten Canyon joins from the east, soon after the first major bend. A short diversion further along the main drainage is worthwhile, as Eagle Canyon constricts to a shallow narrows section that may contain deep mud and stagnant water then shortly after ends, after an open part with some large fir trees, at a huge pool fed by a twisting slot high above on the right side. 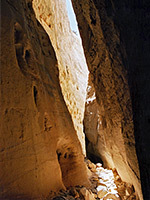 This obstacle could be passed if desired by climbing up the cliffs on the south, though the canyon above this short slot is not particularly interesting. Back to Forgotten Canyon - this is narrow from the start although never becomes a true slot. 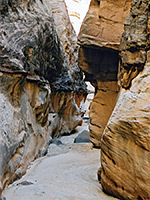 The first stretch, while deepening, is blocked by two piles of boulders several meters high that are quite easy to climb over if dry but much more of a problem if pools are present beneath, then the canyon bends 180° and enters the best section, cutting though jagged, colorful rocks and with a smooth, flat sandy floor. The narrowest point occurs where the ravine turns sharply again to the north, at a 20 foot dryfall, though this can be passed by climbing up a 60° slope on the right side. Thereafter the canyon becomes relatively wide though with some nice shallow narrows, a few pools and smaller dryfalls, all easily passed on benches at either side. Several side canyons join the main ravine which by then is wide and sandy, and continues like this for several miles towards Secret Mesa, hence the alternative name for this drainage.